An updated Little Mountain Policy is coming to Vancouver City Council today, June 27 2012. The most notable issue is that the developer, Holborn, is now openly challenging the cornerstone of the project: that the proceeds of the land sale should fund the 224 ‘replacement’ social housing units onsite. 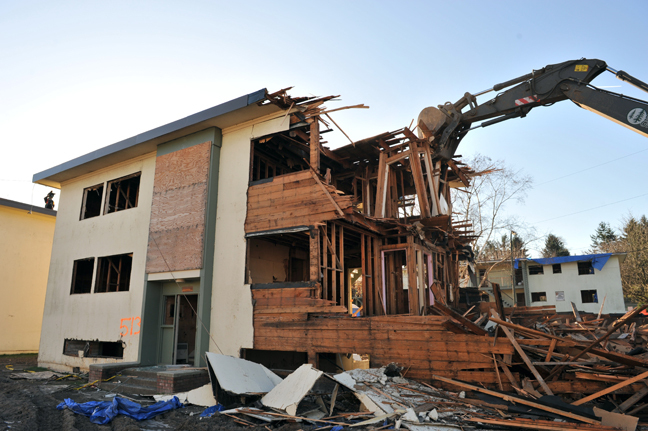 In 2007, the City and the Province agreed that ‘replacement’ social units — to house the 600 people dislocated by the Little Mountain demolition — would be funded from the sale of the land to a developer. The language in the agreement was unambiguous: “Whether the Site is rezoned or not, BC Housing will replace the existing 224 units of social housing on site … BC Housing will invest all of the net proceeds from the sale of the Site (after the existing social housing is replaced on site) into the development of social housing throughout the province. Half the net proceeds (after the existing social housing is replaced) will be invested in the City of Vancouver.” (For an analysis of the offsite housing, please see the article Myth of the 14 Sites by Nathan Crompton). After signing this clear agreement, the Province then chose Holborn Properties Ltd. as the project’s developer. These two parties entered into a separate agreement involving sale of the land to Holborn. However, the terms of the agreement, including the dollar value of the land sale, have been kept from the public. When asked by The Mainlander how much he paid for the land, Holborn CEO Joo Kim Tiah said, “I don’t know, and I can’t share it with you. The price that we paid is confidential, and the terms are confidential. And it will be made known at a date later, at the rezoning.” Common gossip, however, suggests that the land deal was in the realm of $200-300 million, more than enough to fund the replacement units onsite, which would have a price tag of around $50 million. 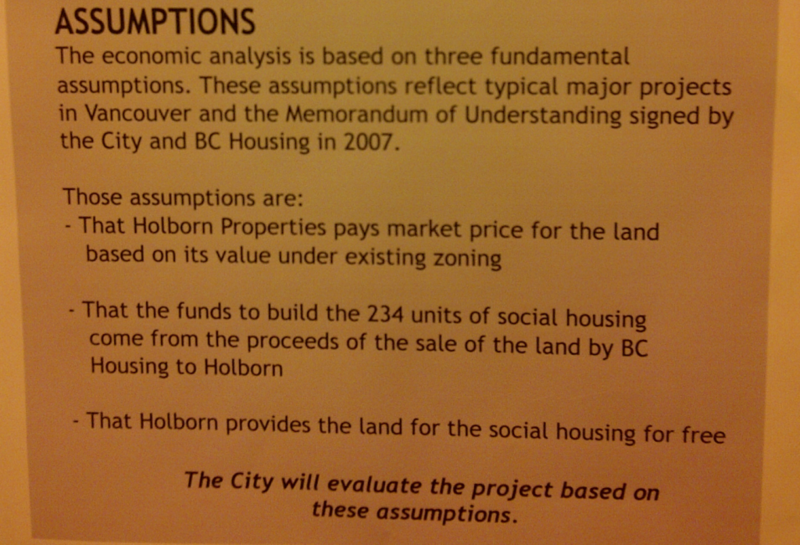 The letter continues: “As this assumption is not consistent with the [confidential] agreement between BC Housing and Holborn where Holborn has to bear the cost of the replacement social housing, the project struggles to be economically viable and provide the amenities on site at the recommended density levels.” In other words, BC Housing won’t build the housing, and Holborn says that as things stand, it can’t afford to. This puts the project as a whole in jeopardy. Holborn’s solution to this stand-off is for the City to upzone the property an extra-ordinary amount. When Holborn bought the land from the Province, the land was zoned as “RM-3A” which allows “a maximum Floor Space Ratio (FSR) of 1.45 and a maximum height of 10.7 metres.” In conversation with The Mainlander, Tiah conceded that he bought the land based on the market value under the current zoning. Now Tiah is asking for a density of 2.8, which would increase the land value by about $40 million, all of which Tiah would have go toward the social housing component (which BC Housing should have already built). For this reason, it’s fair to call this a bailout request. Holborn is suggesting that without this bailout from the public, the project is financially unfeasible and will fail. Indeed the City has been open to upzoning the property, but only to a density of between 2.3 and 2.5, which would increase the land value by between $10 and $20 million, 75% of which will go toward Day Care and a Neighbourhood House. Of course, the City is under no obligation to rezone the land at all, nevermind in an extra-ordinary way. In fact, Council is legally bound to hold public hearings on all rezoning proposals, and to keep an open mind about approving/rejecting. The agreement between the Province and City explicitly recognizes this fact. But the City can do much more. It would be absurd to take Holborn’s word that there is a financial crisis. The City should insist that the terms of the confidential Holborn-Province agreement be made public, so that an assessment can be made based on facts, not on Olympic Village-like scare tactics. Further, it appears that the Province has breached its end of agreement with the City. The City has bent over backwards to destroy Little Mountain, granting demolition permits after a ruthless eviction. It’s time to stop facilitating the Little Mountain tragedy. The City should demand that funding for the replacement housing be made available immediately, under the threat of legal action. The City should also take a stand and say “no” to any rezoning until the province has put up the money for the replacement housing. Rezoning is the City’s strongest negotiating chip, which it shouldn’t give away without strong conditions. 1) Ask for the terms of the Holborn-Province agreement to be made public right now, before proceeding any further with the redevelopment. 2) If the terms contradict the City-Province agreement, the City should take legal action to force BC Housing to replace the social housing immediately. 3) Halt discussion of rezoning until the money for the replacement housing is in the bank. All this suggests that the Little Mountain redevelopment project is in jeopardy. BC Housing promised to fund the replacement housing, but won’t. 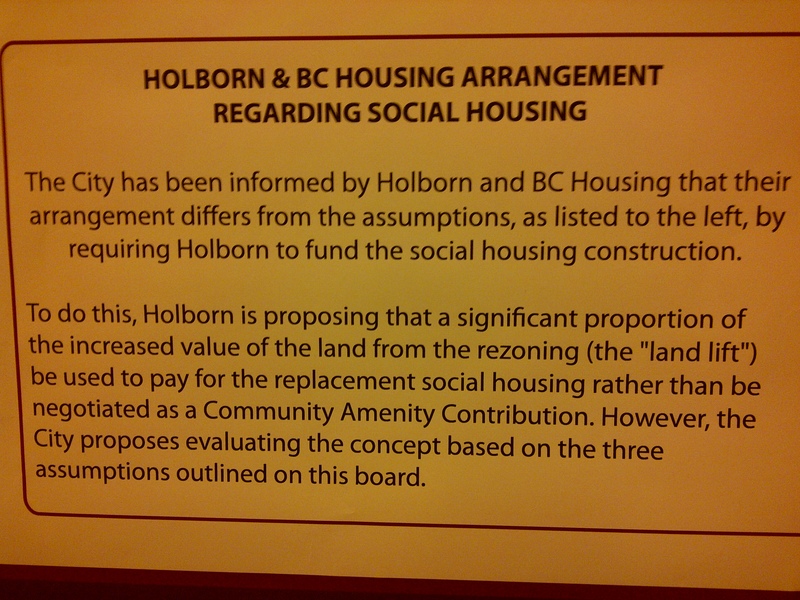 They’ve apparently tried to force Holborn to pay for it, but Holborn is saying it can’t do so without a density bailout. What are the implications of the project being on the rocks? The displaced tenants suffer the most from the delays. If Little Mountain turns into another Olympic Village of broken promises and bailouts, the important thing is to make sure the money is there for the social housing. If it’s not, the fact that the current project is on the rocks could be a blessing in disguise. Although the Province wants to make the Little Mountain redevelopment into a model, it’s a terrible model: it’s cynical, cruel, and counter-productive to fund social housing by demolishing affordable neighbourhoods. The best course forward may be to wait for the next election, allow Holborn to back out, and arrange a better, and more just plan for Little Mountain. Posted in City Hall, Gentrification, Mount Pleasant, Olympic Village. Bookmark the permalink. Why is this a surprise? In the limited contact I’ve had with Holborn they have been evasive, arrogant and rude. They typify all that is wrong with developers in this city. Their website uses all the right words and language to show they care but in reality they are just bullies and opportunists. I say cut them loose and start again, nothing has been lost yet. There are plenty of others firms out there that can take on this project. Ever have that feeling in the pit of your stomach when you know something is very wrong but you just hope it goes away and everything will be alright, well it won’t. Unless the elected officials at city hall start standing up for the people that elected them!